Silver prices were brutalized during the third week of May, tumbling with other precious metals with stiff selling the order of the day for much of the week. Silver’s fall was less severe as compared to other industrial used metals, like platinum and palladium. But its drop was deep nevertheless. London and New York prices follow. 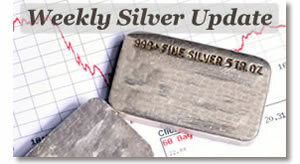 New York silver for July delivery closed to $17.651 an ounce, plunging $1.574 or 8.2% for the week. Prices stabilized a bit on Friday, with the metal pulling back just 6.4 cents. The London silver fix was $17.720 an ounce, plummeting $1.92 or 9.8% for the week. There was no pause in declines, with each succeeding day settling lower. Friday’s daily loss was the least severe at 21 cents. "It would appear that silver continues to garner a significant amount of direction from the equity markets and that suggests silver is still focused on its classic physical commodity market fundamentals and not on flight to quality issues," noted Nell Sloane on StockMarketsReview.com. "In order to see a significant bottom in silver prices probably requires a coordinated aggressive statement of support from outside of the EU and IMF." For daily prices, check out the silver spot price page.